I've spent some time online, to see what shoes will interest me for this fall season. Here are my choices. I have a lot of round-toes ballerinas, but I feel the need to have a pointy pair of flats in my shoe-closet. 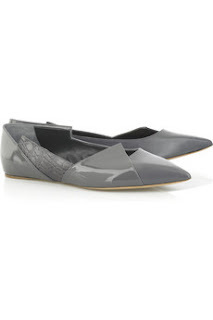 They should be neutral and patent, so the grey ones from Chloe seem like the best choice ever. Maybe net-a-porter.com will have a mid-season 80% sale :)). Or maybe it will rain inside. Which one seems more plausible! Have you noticed that you can find less and less nice mid-heel shoes? I am quite short and my husband is very tall, so flats are not the best choice for me. That's why I wear a lot of heels, but when I need to feel comfortable, yet still having some extra inches; the best solution is a pair of mid-heels. But although I always look for them, mid heel seems something quite exotic in most of the stores. 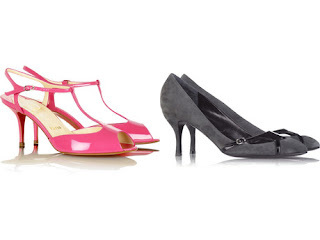 For example, on net-a-porter.com we have 12 pairs of mid heels and 180 ones of high heels. Count the difference for yourself! During summer sales at Mango, I saw this gorgeous pair of cut out peep toe pumps in black and white. They were a little bit pricey, so I didn't grab them when I got a chance! The day after, when I was decided to buy them, they were already gone!